This summer, I have been fortunate to be a supervisor for the N.C. State Government Internship Program, run by the Youth Advocacy and Involvement Office of the Department of Administration. It’s a highly selective program – both for students and for government agencies. After an intense, months-long process of putting together internship proposals and interviewing candidates, we were matched with a terrific grad student (pictured with me, above) to help the content effort for our intranet redesign project. 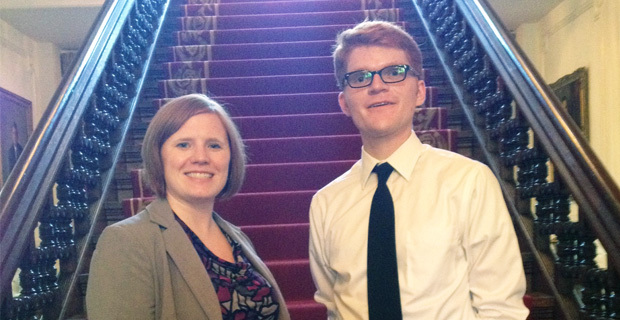 It turned out to be a great partnership, and I’m sad our intern’s tenure is coming to a close on Friday. 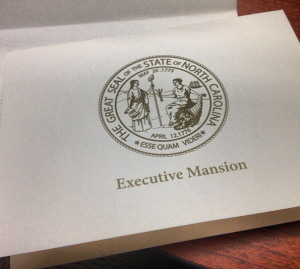 The highlight of the internship program is a reception hosted by the governor at the Executive Mansion. This year, interns and supervisors were welcomed with cookies and cold drinks on a blistering hot day, and we were treated to an address by Governor Pat McCrory as he stood on the staircase of his home. 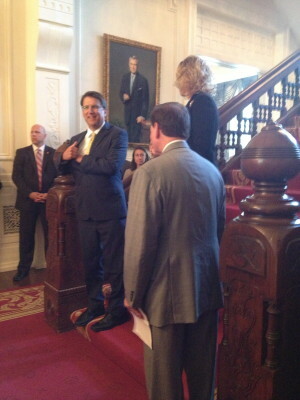 He touched on his previous internship experience, the importance of public service, and a brief tour of the mansion. Our intern definitely deserved such an honor for his hard work and achievements, and I’m sure the other interns are equally as deserving! It was a pleasure to take part in this year’s program – and a real treat to have my first visit to the Executive Mansion with the governor himself as the guide.